The efficient allocation of financial resources for malaria control and the optimal distribution of appropriate interventions require accurate information on the geographic distribution of malaria risk and of the human populations it affects. Low population densities in rural areas and high population densities in urban areas can influence malaria transmission substantially. Here, the Malaria Atlas Project (MAP) global database of Plasmodium falciparum parasite rate (Pf PR) surveys, medical intelligence and contemporary population surfaces are utilized to explore these relationships and other issues involved in combining malaria risk maps with those of human population distribution in order to define populations at risk more accurately. First, an existing population surface was examined to determine if it was sufficiently detailed to be used reliably as a mask to identify areas of very low and very high population density as malaria free regions. Second, the potential of international travel and health guidelines (ITHGs) for identifying malaria free cities was examined. Third, the differences in Pf PR values between surveys conducted in author-defined rural and urban areas were examined. Fourth, the ability of various global urban extent maps to reliably discriminate these author-based classifications of urban and rural in the Pf PR database was investigated. Finally, the urban map that most accurately replicated the author-based classifications was analysed to examine the effects of urban classifications on Pf PR values across the entire MAP database. Masks of zero population density excluded many non-zero Pf PR surveys, indicating that the population surface was not detailed enough to define areas of zero transmission resulting from low population densities. In contrast, the ITHGs enabled the identification and mapping of 53 malaria free urban areas within endemic countries. Comparison of Pf PR survey results showed significant differences between author-defined 'urban' and 'rural' designations in Africa, but not for the remainder of the malaria endemic world. The Global Rural Urban Mapping Project (GRUMP) urban extent mask proved most accurate for mapping these author-defined rural and urban locations, and further sub-divisions of urban extents into urban and peri-urban classes enabled the effects of high population densities on malaria transmission to be mapped and quantified. The availability of detailed, contemporary census and urban extent data for the construction of coherent and accurate global spatial population databases is often poor. These known sources of uncertainty in population surfaces and urban maps have the potential to be incorporated into future malaria burden estimates. Currently, insufficient spatial information exists globally to identify areas accurately where population density is low enough to impact upon transmission. Medical intelligence does however exist to reliably identify malaria free cities. Moreover, in Africa, urban areas that have a significant effect on malaria transmission can be mapped. The public health burden posed by malaria has put its control high on the international development agenda. Recent improvements in the levels of funding for malaria control and their disbursement have resulted in an increase in use of insecticide treated nets and access to effective antimalarial drugs in many malaria endemic countries that are starting to have demonstrable public health impact [1–8]. The rapidly changing malaria landscape (epidemiological and political) requires an accurate and contemporary description of risk with which to help audit future needs objectively and guide resource allocations effectively and equitably . The extremes of both low and high population density modify malaria transmission and have profound consequences for estimates of its public health burden [10–14]. In areas of exceptionally low population density, there may be insufficient numbers of people to support transmission , while urban areas cause marked entomological, parasitological and behavioural effects that result in reduced risks . These effects need to be assessed to help estimate their impact on the risks of Plasmodium falciparum malaria globally. Recent studies have examined the potential of global population and urban extent surfaces for mapping the risks of malaria and identifying populations at risk. Guerra et al [15, 16] estimated the global extent of malaria transmission for 2005 by using a set of rules, including the exclusion of i) all areas where population density was less than one person per km2; ii) urban extents of cities identified as malaria free in travel guidelines; and iii) urban extents of cities with populations greater than one million. Further, the effects of urbanization (measured by population density-based classifications of urban extents) on P. falciparum entomological inoculation rate (EIR) were also used to reduce endemicity in urban areas by stepwise reductions in categorized endemicity classes, before estimating populations at risk and the mortality attributable to P. falciparum malaria in Africa . A similar logic was used to downgrade endemicity classes for the hypothesized effect of urbanization in recent global estimates of the P. falciparum morbidity burden . Finally, population counts and a compilation of medical intelligence on malaria risk in large cities were used to define the limits of unstable P. falciparum malaria transmission globally . 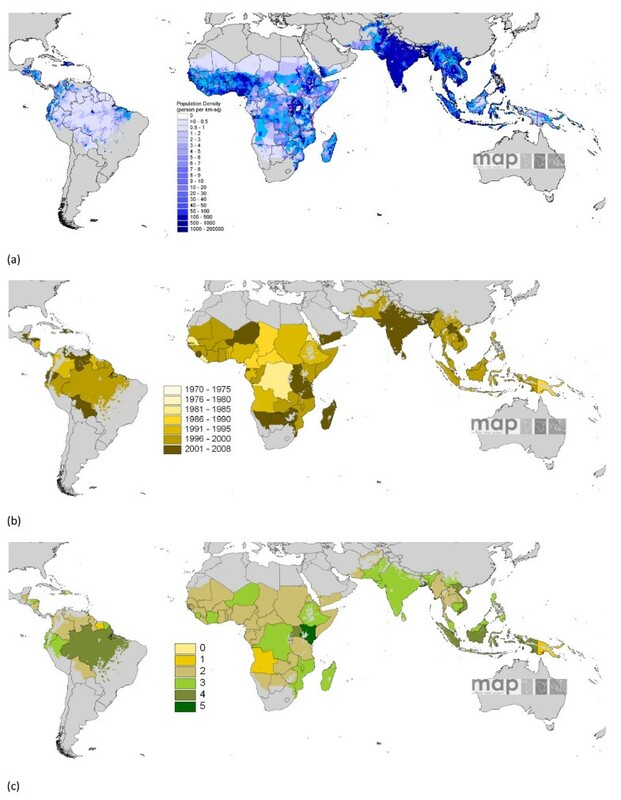 This paper documents efforts to use a global population database, medical intelligence and urban extent maps to identify and describe spatially those areas of the malaria endemic world where human population densities are lowest and highest, resulting in modified transmission and, thus, impact upon malaria burden. Further, the Malaria Atlas Project (MAP) global P. falciparum Parasite Rate (Pf PR) survey database is used to explore relationships between human population density, settlement patterns and P. falciparum malaria transmission, in order to refine rules for data exclusion and transmission reduction required in estimating populations at risk for future mapping initiatives and burden estimates. Finally, the problems and drawbacks that exist in using global spatial population databases and counterpart urban maps as demographic components for malaria risk mapping are highlighted. The rigorous process of identifying, assembling and geo-locating community-based survey estimates of P. falciparum parasite prevalence undertaken since 1985 has been described previously [19, 20], where Pf PR estimates have been reported in a wide variety of age groupings. To standardize to a single, epidemiologically important age range (2.00–9.99 years), an algorithm based on catalytic conversion models first adapted for malaria by Pull and Grab  and described in detail elsewhere  was applied. Surveys that could only be geo-referenced to administrative unit polygons, rather than precise locations, were removed before analysis to ensure that only the most accurately geo-located surveys were used . A total of 3,525 geo-referenced survey points were used in the analyses, of which, 2,376 (903 rural, 292 urban, 1,144 unclassified) were in Africa, 109 (97 rural, two urban, seven unclassified) in the Americas and 1,040 (428 rural, 15 urban, 506 unclassified) in the central and south-east Asia region. Figure 1 shows the distribution of Pf PR surveys used in this study overlaid on the spatial limits of malaria transmission , with dividing lines showing the 'Africa+' region (Africa, Yemen and Saudi Arabia). This was analysed separately from the rest of the world in this paper. The spatial limit of Plasmodium falciparum malaria risk defined by P. falciparum annual parasite incidence ( Pf API) with temperature and aridity masks. Areas were defined as stable (dark grey areas, where PfAPI ≥ 0.1‰ pa), unstable (middle grey areas, where PfAPI < 0.1‰ pa) or no risk (light grey) [17–19]. The borders of the 87 countries defined as P. falciparum endemic are shown. The community surveys of P. falciparum prevalence conducted between 1985 and 01 March 2008 are plotted. Of the 4,887 surveys that could be geo-positioned, 4,077 fell within the predicted limits of P. falciparum malaria risk. The data shown are age-standardized (Pf PR2–10) and shown as a continuum from 0–100%. The dashed lines indicate the separation between the area defined as 'Africa+' (Africa, Yemen and Saudi Arabia) and the rest of the world used in the analyses. The principal source of human population distribution data used for assessing the effects of low and high population densities on Pf PRs in this study was the Global Rural Urban Mapping Project (GRUMP). The GRUMP spatial population database provides global gridded population density estimates at ~1 km spatial resolution. The data and methods used to construct GRUMP are described elsewhere [24, 25]. In brief, the most recent census, and other demographic data at the highest possible administrative boundary level available, were obtained for every country in the World, and areal weighted . An urban extent mask, GRUMP-UE (described below), was then used to adjust population numbers within each extent to match estimated totals for each settlement in question. Finally, the individual national population surfaces were projected to the years 1990, 1995 and 2000 and adjusted to match the national population totals estimated by the United Nations' Population Division . The clearly documented methods, the substantially larger number of administrative units used to create the database, and tests showing its higher accuracy over other products [26, 28], have led to the use of GRUMP for the current analyses. UN-adjusted population counts and densities for the year 2000 were obtained from . For Burundi, Kenya, Rwanda, Tanzania and Uganda, the mapped surfaces were replaced with those described in Tatem et al. , as they have been shown to be more accurate. Prior to replacement the surfaces were adjusted to 2000 and degraded to the same approximate 1 km spatial resolution as GRUMP. The entire global surface was projected to 2007 by applying national, medium variant, inter-censal growth rates by country , using methods previously described . Figure 2 shows the resultant population density surface, alongside the year and administrative boundary unit level of the census data used to make the surface. Each is masked by the limits of malaria transmission , as defined in Figure 1. (a) Modified GRUMP  masked by the limits of Pf malaria transmission  and projected to 2007 . The red border highlights where data from Tatem et al  were inserted. (b) The date of the census data used in the construction of the population surface in (a), and (c) the administrative unit level of census data used in the construction of the population surface in (a). The use of an urban extent mask to adjust population totals and densities within areas defined as urban, means that GRUMP estimates of urban population densities are biased by the specific features of this mask. Moreover, the mask has been shown to overestimate consistently the extent of urban areas [29, 30]. Given the aim of this study to also examine the effects of population densities on Pf PRs within urban areas, subsequent to the choice of the most accurate urban map, a population database unbiased by choice of urban definition was required. For this, the Gridded Population of the World version 3 (GPW3)  population density database was obtained and projected to 2007. GPW3 uses the same areal weighted census data as GRUMP as input, but implements no urban adjustments and therefore, unlike GRUMP, is independent of urban definition, making it useful for examining population density variations within urban extents that have been mapped independently. To assess the ability of existing datasets to identify areas where urbanization has a significant effect on malaria transmission, a set of public domain global urban maps was obtained (Table 1) [13, 15, 27, 31–36]. The ambiguity over what constitutes an urban area and consequently, urbanization, has led to several attempts to generate global and continental-scale urban maps using consistent methods, and many of these were analysed in Tatem et al . For this study, the maps documented in Table 1, which include the 'urban' classes from two global satellite sensor-derived land cover maps (Advanced Very High Resolution Radiometer, AVHRR, and Moderate Resolution Imaging Spectroradiometer, MODIS) and the 'populated built up area' features from military mapping data (VMAP0), were acquired. The full GRUMP-UE map, created principally using night-time lights satellite imagery [24, 37], was also acquired, as was an edited version of GRUMP-UE containing only the extents of those 123 cities within the limits of malaria transmission with populations greater than 750,000, as defined by the United Nations World Urbanization Prospects 2005 database  (Edited GRUMP-UE). Finally, population density based urban extent maps were created following the rules outlined in Guerra et al  and Hay et al . In each case more contemporary population projections  and urban population totals  were used. Moreover, the Hay et al methodology was applied to both GRUMP and GPW3, with the 'urban' and 'peri-urban' (areas around urban extents with substantially higher population densities than the surrounding rural areas) classes merged into a single urban class, alongside also maintaining the 'urban' class and assigning the remaining classes to 'rural'. GRUMP-UE = Global Rural-Urban Mapping Project Urban Extents; AVHRR = AVHRR Global Land Cover Classification urban land cover class; MODIS = MODIS Land Cover Product Binary Data from Boston University; VMAP0 = Vector map level zero; GUERRA = Population density based map described in Guerra et al. ; HAY-GPW-U = Population density based map described in Hay et al. , maintaining 'urban' class as urban and the remaining 3 classes merged to form the rural class; HAY-GPW-U-PU = Same as previous map, but merging 'urban' and 'peri-urban' classes into a single urban class; HAY-GRUMP-U = Same as previous map, but classes were defined using GRUMP and maintaining 'urban' class as urban and the remaining 3 classes merged to form the rural class; HAY-GRUMP-U-PU = same as previous map, but merging 'urban' and 'peri-urban' classes into a single urban class. Some urban areas within malaria endemic regions are known to be malaria free, and thus can be eliminated from further analyses. Information on such areas are provided by ITHGs, the two most comprehensive of which, the 'Health Information for International Travel' produced by the Centers for Disease Control  and the 'World malaria risk chart' produced by the International Association for Medical Assistance to Travellers , were obtained. These were then cross-referenced to identify any urban areas within malaria endemic countries identified explicitly as malaria free. To provide a basic division between high and low Pf transmission areas for analyses, while maintaining sufficient data, a vegetation index-based stratification was created. High and low vegetation zones were defined by the mean annual Normalized Difference Vegetation Index (NDVI) , as measured by the AVHRR satellite sensor. This imagery is described in detail elsewhere . The NDVI image was split into two classes that have proven to be relevant to malaria ecology [13, 43, 44], whilst ensuring that sufficient numbers of surveys remained in each class for statistical tests. These classes were, class 1: NDVI < 0.35 (1036 surveys), corresponding to drier, less vegetated areas and class 2: NDVI > = 0.35 (2489 surveys), corresponding to wetter, more vegetated areas (Figure 3). For each of the following tests, analyses were performed globally and then separated between Africa+, and the remainder of the world. This division allowed the biogeographically, entomologically and epidemiologically distinct regions [45, 46] to be considered separately, whilst retaining sufficient data in each region for meaningful analysis. The Normalized Difference Vegetation Index (NDVI) classes used in this study. The NDVI was calculated from AVHRR, then classified into NDVI < 0.350, corresponding to drier, relatively less vegetated areas and NDVI > = 0.35, corresponding to wetter, relatively more vegetated areas. To assess the effects of applying different thresholds of low population density on land area, population numbers and Pf PR surveys excluded, the modified GRUMP surface was reclassified to highlight those areas where population density was = 0, < = 0.01, < = 0.02.... < = 0.9, < = 1 persons per km2. For each classification, the total area covered by the class in question was calculated, as well as the total population numbers and details of Pf PR surveys included. These data were plotted to visualise the effects of the different low population density thresholds. For each threshold, the mean Pf PR of the surveys excluded was compared to those remaining using a Mann-Whitney U-test , to determine if such thresholds identified surveys with significantly lower Pf PRs. Additionally, the effects of using different categories of areas gazetted as national parks, reserves, etc, to identify low population densities were investigated, and are described in additional file 1: Gazetted Areas. A simplified summary of the main steps taken in the analysis of the effects of high population densities and urbanization on Pf PR is shown in Figure 4. Firstly, the features of the Pf PR surveys falling within those areas defined as urban by each map detailed in Table 1 were examined to assess whether spatial information on urban extents can be used as a mask of zero transmission, as has been implemented in the past [15, 16]. Steps taken in the analysis of the effects of high population densities and urbanization on Pf PRs. Analyses were undertaken globally and split between Africa+ and the rest of the world. Secondly, author defined rural/urban classifications of Pf PR surveys were used to examine whether previously documented effects of urbanization on malaria transmission, based on an examination of EIR and other health metric data , existed for Pf PRs, both globally and between Africa+ and the rest of the world. Of the 3525 Pf PR surveys considered in this paper, 50.5% included an author-defined indicator of whether the survey was carried out in a 'rural' or 'urban' community. With the inaccuracies, inconsistencies and difficulties that exist in mapping urban extents over the malaria endemic regions of the world [29, 48, 49], these author-defined assignments, while resulting from partly subjective decisions and perceptions, represent the most reliable indicators available on the rural/urban setting of each Pf PR survey, and are made using criteria cognisant of local malaria epidemiology. To assess whether significant differences in urban and rural transmission existed, sets of proximate (spatially and temporally) urban and rural surveys were identified for comparison. For every survey identified by the survey author as being carried out within an urban area, the nearest surveys carried out in rural locations (again defined by the survey author) within 100 km and 5 years were identified. If no such surveys were found, then this urban survey was dropped from the analyses. Of the rural surveys (conducted within 100 km and 5 years of each urban survey in question) identified, the mean Pf PR was calculated and assigned to that urban survey to make a rural-urban pair of Pf PRs for analysis. These rules produced a set of urban-rural Pf PR survey pairs, from which tests of the difference between urban Pf PR values against rural values could be made. Given the skewed distribution of Pf PR values in the MAP database , the Wilcoxon signed-ranks test for paired variables , a nonparametric alternative to the t-test, was used to assess the differences. Tests were undertaken globally, by NDVI class and by continent (Africa+ compared with the rest of the world) to identify differing trends. Third, if significant differences were found to exist between the author-defined urban and rural Pf PR values, a map which replicated these definitions accurately was required to provide a consistent, malaria-relevant basis for identifying those areas that are urbanized sufficiently to affect transmission. Moreover, the map would enable the consistent assignment of an urban/rural class to the entire set of Pf PR surveys, when only 50.5% of surveys currently have an author-defined classification. Again taking the author-defined urban/rural classification as being most reliable in terms of local malaria epidemiology, the ten different maps of urban extent (Table 1) were tested to examine which one described this author-based assignment most accurately. The Pf PR surveys with an author-defined rural/urban assignment were overlaid on each urban extent map using GIS software and the urban/rural map class was extracted for each point. These class assignments were then compared to the author assignments using confusion matrix-based statistics: percentage correct, producer's accuracy, user's accuracy and kappa . 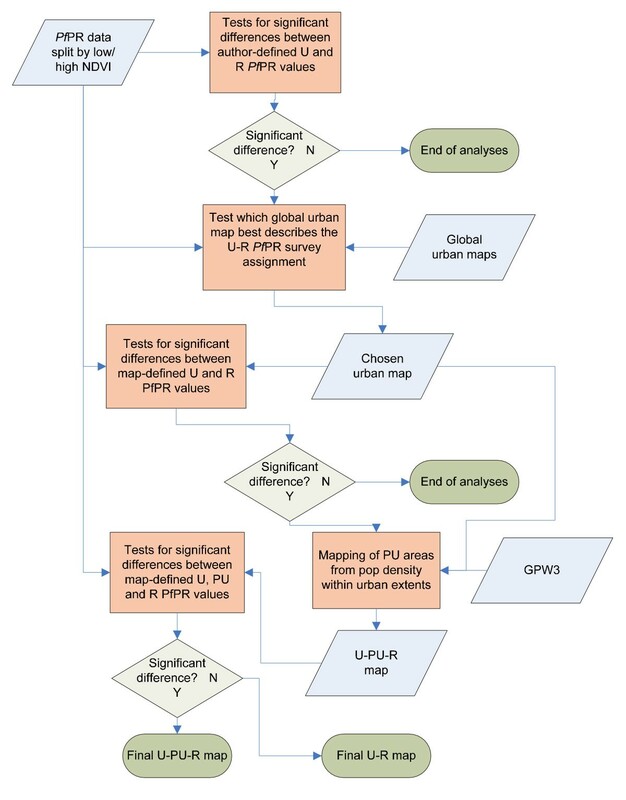 Fourth, the urban map determined to be the most accurate in matching the author-defined classifications was then tested to examine the influence of urbanization on Pf PR using the entire set of Pf PR surveys with their new urban-rural assignments from the map. The Pf PR survey locations were overlaid on the chosen urban map and the urban/rural class assignment was extracted for each point. As described above, sets of spatially and temporally proximate urban and rural surveys were again identified to check for significant differences between urban and rural Pf PRs. For each point classified as urban, the surveys classified as rural within 100 km and 5 years were identified and their Pf PRs averaged, to create a set of map-defined urban-rural Pf PR pairs. This set was subject to Wilcoxon signed-rank tests to ascertain if significant differences in Pf PR values existed between urban and rural surveys. Fifth, to examine local variations in urban-rural Pf PRs, where possible, the corresponding urban extents within the chosen urban map of the 123 UN-defined cities, as described in Table 1, were identified, and the centroids of each extent calculated. For each city, a 100 km wide circular buffer centred on the city centroid was created. Cities for which at least two Pf PR surveys fell within the city extent (urban) and at least two Pf PR surveys fell within the remainder of the 100 km buffer (rural) were identified. For these cities, the urban and rural Pf PR values were compared and Mann-Whitney U-tests were undertaken to assess the significance of any differences seen. Finally, given the known difficulties in mapping urban extents that lead to extent overestimation [29, 30] and the effects of 'peri-urban' areas on transmission , the distribution of population densities within urban areas was examined to assess whether mapped peri-urban areas had a discernible effect on Pf PRs, when compared to those from urban and rural areas. As described above, its independence from urban adjustment meant that GPW3 was used to map these peri-urban areas. The threshold in defining 'urban' populations, of 1000 people per km2 or above, as shown to be relevant to malaria transmission by Hay et al. , was mapped within urban areas, as defined by the chosen urban map. The urban Pf PRs above and below this threshold were then examined to ascertain if significant differences existed. For each Pf PR survey within the high population density urban area ('urban'), a corresponding set of lower population density urban area surveys ('peri-urban') and rural area surveys were identified, ensuring that these two sets of surveys were undertaken within 100 km and 10 years (to ensure sufficient numbers of points for testing) of the 'urban' survey. The averages of the peri-urban and rural sets of Pf PR surveys were calculated and assigned to their urban Pf PR counterpart to make location-specific sets of urban, peri-urban and rural Pf PRs for testing of any trends in transmission rates by urban gradation. The nonparametric Friedman's ranking test for related samples  was undertaken to assess the significance of any differences. Figure 5 shows the results of low population analyses on the entire Pf PR survey dataset, not stratified by NDVI or continent. Figure 5 illustrates that even the most conservative threshold, identifying areas where population density is zero excludes many Pf PR surveys. Raising this threshold merely increases the number of Pf PR surveys excluded, with a consistent 80% or more of those excluded being non-zero Pf PR surveys. Globally, and for each NDVI class and continent, no significant differences in Pf PR were observed between those surveys within the low population density exclusion zones and the remainder of the surveys at any threshold. 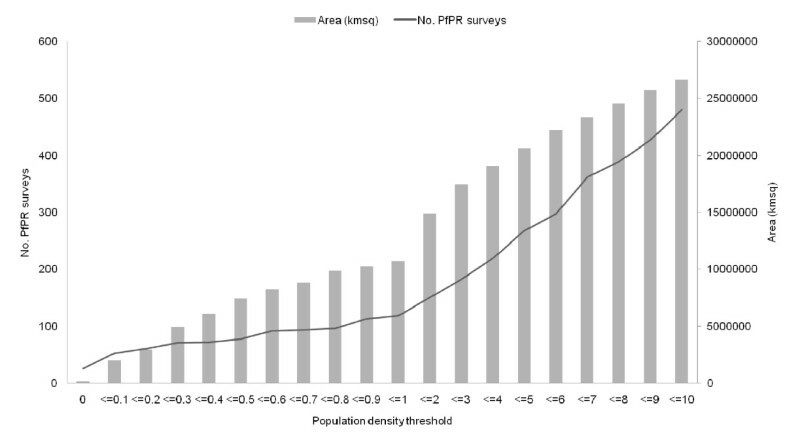 Land area and number of Pf PR surveys excluded by varying population density thresholds. GRUMP was reclassified using the thresholds on the x-axis, and for each threshold level, the land area below the threshold was calculated, as well as the number of Pf PR surveys within this area. Those cities within malaria endemic countries that are identified explicitly as malaria free by the ITHGs are listed in Table 2. Table 3 shows the features of Pf PR surveys conducted within urban areas as defined by various criteria. In every case, over 87% of surveys conducted in areas mapped as 'urban' found Pf PRs greater than zero, though in many cases, only a small number of those areas mapped as urban had a survey conducted within them. The results of Wilcoxon signed-ranks tests between Pf PR values from the paired urban and rural sites, as defined by the survey author, are shown in Table 4. Results indicate clearly that strong significant differences exist between Pf PRs sampled in urban and rural locations globally, with urban areas exhibiting consistently lower values (average difference = 30.54%). This difference is due to Africa+ only, as similar results were not found for the Pf PR surveys across the rest of the world, with no significant differences found between rural and urban surveys, though the sample size was small. Figure 6 shows boxplots for these pairs, stratified by NDVI class, and emphasises the difference between author-defined urban and rural Pf PRs in Africa+, with the surveys conducted in the higher NDVI class showing a greater separation. Boxplots showing the differences in Pf PRs by author-defined rural-urban survey pairs for surveys where mean annual NDVI is (a) less than 0.35 and (b) greater than or equal to 0.35 (* = p < 0.05, ** = p < 0.01). (U) and rural (R) survey pairs (* = p < 0.05, ** = p < 0.01). Table 5 shows the results of the accuracy assessments carried out to determine which global urban map best described the author-defined urban/rural assignments. GRUMP-UE produced the most accurate match, with the largest percentage correct and a kappa of 0.624. Following this, Table 6 shows the results of Wilcoxon signed-ranks tests between Pf PR values from paired urban and rural sites, as defined by GRUMP-UE. Results again show clearly that strong significant differences exist between urban and rural Pf PRs in Africa+, while no significant differences are found outside of Africa+, though sample sizes were small. Stratification by NDVI values shows that the urban-rural differential in Pf PR values is again more pronounced in the wetter, greener areas than in the drier areas, where NDVI is low. The Z values highlight, however, that the differences are not quite as clear as they are when defined by the survey author (Table 4), indicating both the difficulties in mapping urban areas globally and potential inconsistencies in author definitions of urban. The producer's accuracies show, of those defined by the authors as urban/rural, the percentage classified correctly, while the consumer's accuracies show, of those classified as urban/rural by the global map in question, the percentage of surveys classified correctly. The kappa statistic compares agreement between each map and the author-defined definitions against that which may be expected by chance, with values ranging from 1 (perfect agreement) to 0 (no different from chance agreement) to -1 (perfect disagreement). 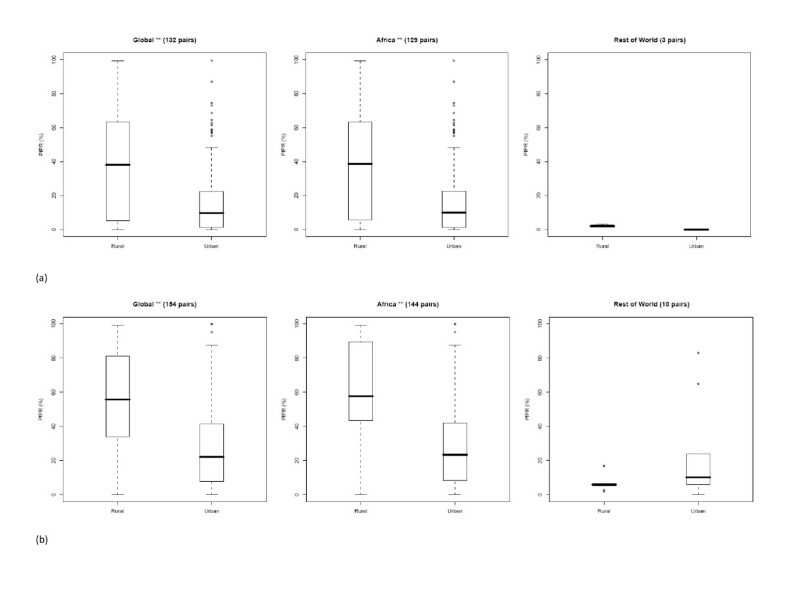 Boxplots of Pf PR values by GRUMP-UE urban/rural assignments for individual African cities where more than one urban and one rural Pf PR survey were available are shown in Figure 7. The consistent pattern of lower Pf PR values in urban areas than found in the surrounding rural regions is again evident. Overall, and for many individual cities, these differences are highly significant. For those cities where the differences seen in the boxplots were not found to be significant, this is likely due to insufficient numbers of survey points to achieve significance. Boxplots showing the differences in Pf PR values by GRUMP-UE defined rural/urban assignment for cities where mean annual NDVI is (a) less than 0.35 and (b) greater than or equal to 0.35 (* = p < 0.05, ** = p < 0.01). The number of points in each class is shown in brackets below each plot. The urban extents in GRUMP-UE were reclassified to urban and peri-urban based on the GPW3 population density threshold, and 121 individual sets of proximate urban, peri-urban and rural Pf PR surveys were identified for Africa+. Figure 8 shows the boxplots of all of these combined, and stratified by NDVI class. In each case, clear differences are seen, with the Friedman test indicating that these differences are highly significant (p < 0.01). Figure 9 shows the peri-urban and urban extents mapped globally, within the limits of malaria transmission. 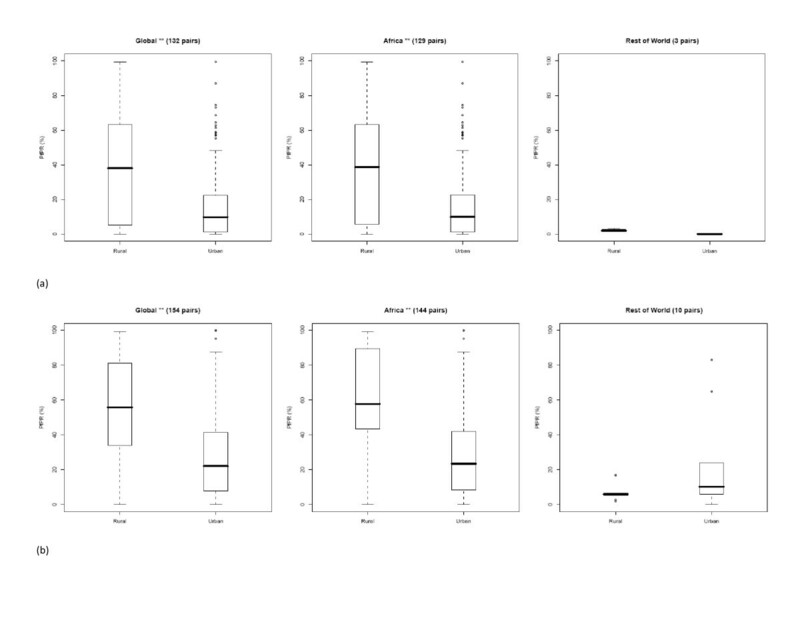 Boxplots showing the differences in Pf PRs by GRUMP-UE/GPW3-defined rural, peri-urban, urban survey sets for (a) all surveys in Africa+ and those where mean annual NDVI is (b) less than 0.35 and (c) greater than or equal to 0.35 (* = p < 0.05, ** = p < 0.01). Peri-urban and urban extents for all malaria endemic countries within the limits of Pf malaria transmission. The extents are a combination of GRUMP urban extents and GPW thresholded population densities, defined using the MAP Pf PR database. The rapid demographic shifts occurring across the developing world  are having profound effects on rates of morbidity and mortality attributed to many diseases and conditions . These shifts impact upon malaria transmission and create a need for accurate and epidemiologically relevant spatial information on population distributions and urbanization to calibrate populations at risk (PAR) for disease burden estimation. Here medical intelligence and the newly assembled MAP Pf PR database have been used to examine how existing spatial demographic databases can be used to improve PAR estimation. It is important to emphasise that these results are based on an opportunistic sample of the malaria endemic world. The mapping of areas of low population density has been used in the past to create masks of zero malaria transmission [15–17]. Results here suggest that contemporary spatial population databases are of insufficient detail to achieve this effectively. Figure 5 shows that, even using the global population database with the greatest number of input census units (GRUMP) and a zero population density threshold, 37 Pf PR surveys are excluded, with the majority of malaria surveys exhibiting prevalences above zero. As this threshold is increased, the number of surveys excluded rises. Moreover, no significant differences in Pf PR values were found at any of these thresholds between those surveys in the excluded areas and those surrounding them. Low population definitions cannot, therefore, be used to identify zero risk in malaria endemicity maps. Similar results were also found for the gazetted areas and are provided in additional file 1: Gazetted Areas. Figure 2 demonstrates why the masking of epidemiologically relevant low population density areas is problematic. GRUMP incorporates the majority of the most contemporary and highest resolution spatially-referenced census data available, but for much of the malaria endemic world, this data is still many years old (Figure 2(b)) and at an administrative boundary level too low to identify small settlements (Figure 2(c)). Some of these problems may be alleviated with the release of GRUMP beta in late 2008, which will incorporate more contemporary, higher resolution data, alongside more recent UN country estimates and an improved water body mask (D. Balk, G. Yetman, pers. comm.). Steps have also been initiated to improve upon GRUMP using novel satellite sensor imagery-based approaches combined with detailed land cover information [28, 49]. Recent work has used urban extent maps to reduce classified risks in large urban areas for malaria mapping and PAR estimation [15, 16]. Since this could only be implemented categorically in historical malaria maps, where endemicity values were binned into classes [17, 55], this often resulted in the zeroing of risk. Table 3, however, suggests that low levels of transmission occur in the majority of urban areas for which Pf PR surveys were conducted. It is often not clear that all patients examined during the malaria survey have had their travel history checked and, thus, whether the sample is a true reflection of local transmission. Nevertheless, the results in Table 3 emphasise that urban areas, however they are mapped, should not be used as an absolute exclusion of malaria transmission. The exceptions to this rule are urban areas for which reliable ancillary data exist to confirm zero transmission. Such datasets, in the form of ITHGs, provide useful and explicit information on malaria free cities (Table 2), which can be linked to urban maps. Moreover, in combination with multi-year annual parasite index data and conservative exclusion masks based on measures of aridity and length of sporogony, these information have been used recently to produce maps of the limits of malaria transmission in 2007 [18, 19]. Table 4 and Figure 6 provide evidence corroborating previous findings that urban areas suffer significantly reduced P. falciparum malaria transmission . While there were insufficient sets of author-defined urban-rural Pf PR pairs to assess whether reduced transmission occurred in urban areas across Asia and the Americas, in Africa+ the differences were highly significant. It should also be emphasised that heterogeneity existed amongst the results, with 50 out of 273 urban-rural Pf PR pairs showing higher rates in areas mapped as urban, than those nearby mapped as rural. The results also followed the wet/dry climate-related patterns in malaria urban-rural transmission differences found by Hay et al . For Africa+, Figure 6 reveals clear differences in the urban-rural Pf PR differential between NDVI zones, where those surveys conducted in wetter areas showed a clearer separation between urban and rural Pf PRs. The ratio between the medians remained the same between zones, however, with the median Pf PR in urban areas being around 40% of that in rural areas. In high transmission areas, where, for example rural Pf PR = 60%, this equates to a significant drop in entomological inoculation rate (EIR) from around 20 to 1 between rural and urban areas, respectively . In lower transmission areas, this change is less substantial due to the non-linear PR-EIR relationship , with an EIR difference between rural and urban areas of just 0.9, for areas where rural Pf PR = 20%. These results are consistent with previous findings on the effects of urbanization on EIR, with transmission reduction being significantly larger in high transmission areas . It is clear from Tables 5 and 6 that only the urban mask used to create GRUMP is of sufficient detail to identify those urban areas which have a significant effect on malaria transmission. Moreover, for those cities where sufficient Pf PR surveys exist within and near mapped extents, there are again clear differences in prevalence (Figure 7). The over-estimation of large urban extents exists within GRUMP-UE due to the 'over-glow' effect present in the night-time lights imagery used to produce it [29, 48]. This effect means that the mapped extent of many well-electrified large settlements may also include less intensely-urban areas at their periphery, where malaria transmission may be significantly higher than that in the centre. Given the lack of globally consistent data on urban 'intensities', results here have shown that population density measures within urban extents can be used to discriminate between malaria-relevant urban and 'peri-urban' areas, identifying significant gradations that distinguish different levels of transmission (Figure 8). Various recent studies have adjusted for urbanization in estimating malaria risk, PAR and burden over continental to global scales [13, 15–17, 57–60], but few have attempted to make use of medical intelligence information and assess the accuracy of the urban maps used, the epidemiological relevance of the urban-rural division adopted and the possibility of incorporating gradations of urbanization into these stratifications. 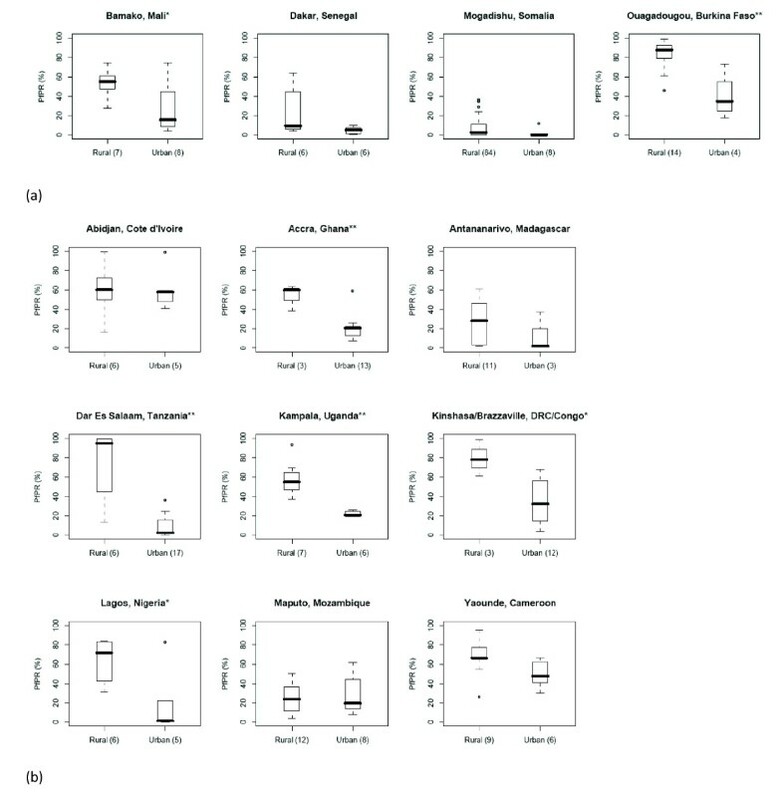 This study highlights several ways that these data and relationships can be used in the mapping of Pf malaria endemicity. First, the ITHGs and other medical intelligence provide a valuable first step in identifying malaria free urban areas [18, 19]. Second, when wanting to assign the urban/rural status for a malaria survey for which such information was not reported, the GRUMP-UE surface should be used. Third, incorporation of GPW population densities also enables discrimination of an epidemiologically relevant peri-urban class for survey assignment. Fourth, the significant relationships shown in Figure 7 indicate that, in the Africa+ region, rural, peri-urban and urban regions should be treated separately when the aim is to produce continuous prevalence or endemicity class predictions. Outside of Africa there is insufficient evidence from malaria surveys to support an informed decision. Increasing computer power, the proliferation of geographical information systems (GIS) and the widespread availability of spatially-referenced human population census data have enabled significant advances in global spatial demography in the last decade , facilitating demographic denominators of disease risk to be estimated at sub-national scales, matching the spatial fidelity of advanced disease risk maps themselves. Such advances potentially facilitate the incorporation of sub-national spatial variations and burden estimates into major global disease burden assessments for the first time . Recent trends are increasingly towards the use of spatial databases of human population and urbanization to estimate populations at risk, burdens, urbanization effects and infectious disease spread, e.g. [19, 63–68]. Nevertheless, while emphasis is being placed more than ever upon mapping and incorporating spatial uncertainty into disease risk modelling, the uncertainties inherent in the estimates of the demographic denominators are often overlooked. Figures 2(b) and 2(c) highlight that, even in GRUMP, the population database with the most contemporary and highest resolution census data, much of the input data used is well over 10 years old and at low administrative unit level. The spatial and temporal errors and uncertainties that inevitably arise upon using these data for estimating present populations at risk at high resolution have yet to be quantified. Future work will examine approaches for estimating these uncertainties inherent in gridded population databases, to enable complete assessments of uncertainty in disease burden estimation. Moreover, the high resolution population mapping work will be extended beyond East Africa  to increase spatial detail and accuracies. The authors are grateful to Bob Snow, Pete Gething, Fred Piel, Marianne Sinka and Anand Patil for comments on the original manuscript. Bob Snow is also thanked for guidance and intellectual input throughout the work. CAG is supported by a Wellcome Trust Project grant (#076951). SIH and AJT are funded by a Senior Research Fellowship from the Wellcome Trust (#079091 to SIH). AMN is supported by the Wellcome Trust as a Research Training Fellow (#081829). All authors acknowledge the support of the Kenyan Medical Research Institute. This work forms part of the output of the Malaria Atlas Project (MAP, http://www.map.ox.ac.uk), principally funded by the Wellcome Trust, U.K.
AJT conceived, designed and implemented the research and wrote the paper. SIH aided with ideas, methodological and editorial input. CAG, CWK and AMN provided support in data compilation. The final version of the manuscript was seen and approved by all authors.